Our camper’s overall health and well being is always our primary concern. At Poyntelle, we believe in creating a diverse daily program that encourages sports and an active lifestyle. Exercise is just as important to us, as it is to you at home. We match our physical activities with nutritional and balanced meals. Our menu is complete with enough choice for our children with allergies and even our most picky eaters. Camp spirit explodes in our dining hall with smiling faces, music and dancing on a daily basis! Campers sit by division with their counselors and friends. We are strictly Kosher Style which means we never mix meat and dairy. We also never serve restricted products such as pork or shellfish. 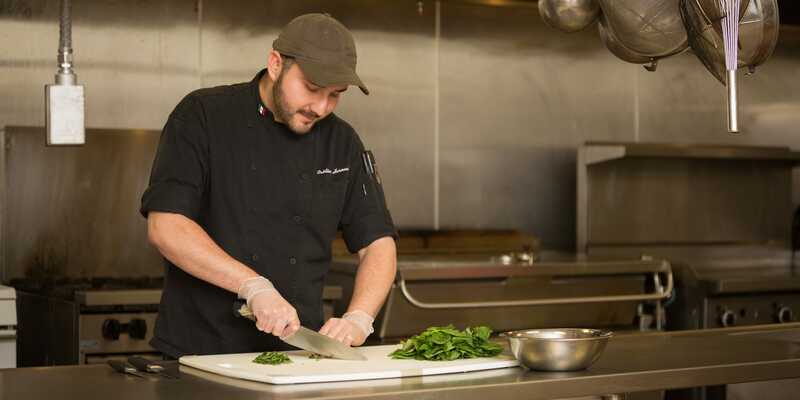 Our talented Food Service also provides Kosher meals to any member of our camp community that requires them. These meals are identical to what is served to everyone else and are cooked fresh from scratch – never frozen or pre-packaged. 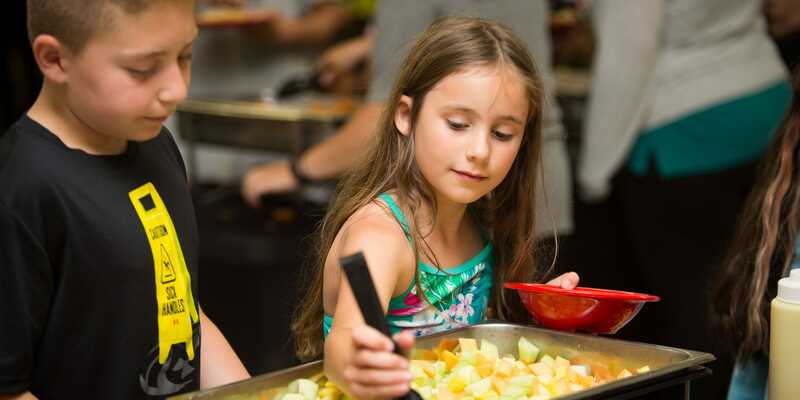 Since we serve buffet style meals, we simply have a separate Kosher station which allows all children to receive their food at the same time. Hot breakfast items include waffles, bagels, pancakes, scrambled eggs, fresh cut fruit, omelettes and french toast. Campers may also choose to have oatmeal, hard-boiled eggs, toast, a large selection of cold cereals, juices, milk and yogurt. Lunch and dinner always include a full salad bar, featuring everything from lettuce and fresh cut vegetables, tuna, chicken and egg salad, avocado, hummus, bean salads, quinoa and edamame salad. While we are 100% nut free, campers are also welcome to make their own Wow Butter and Jelly sandwiches at every meal. Fresh fruit is available all day at various spots on campus, and every day at 3:15pm is Snack, at which time we serve a wide array of various after school type snacks such as ices, goldfish, granola bars, pretzels or pirates booty. 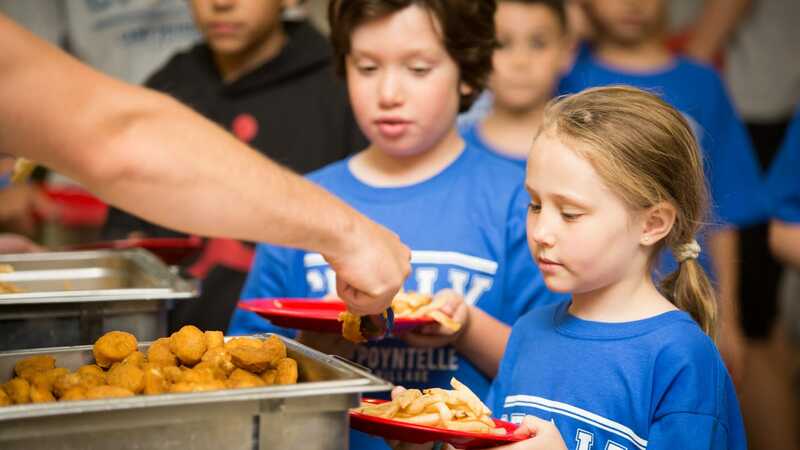 Camp Poyntelle is equipped to manage unique dietary requirements for our many campers with food allergies. Our chef prepares these meals daily and our staff ensure the children receive their proper food at each meal. We have multiple options at snack time that encompass all allergies. 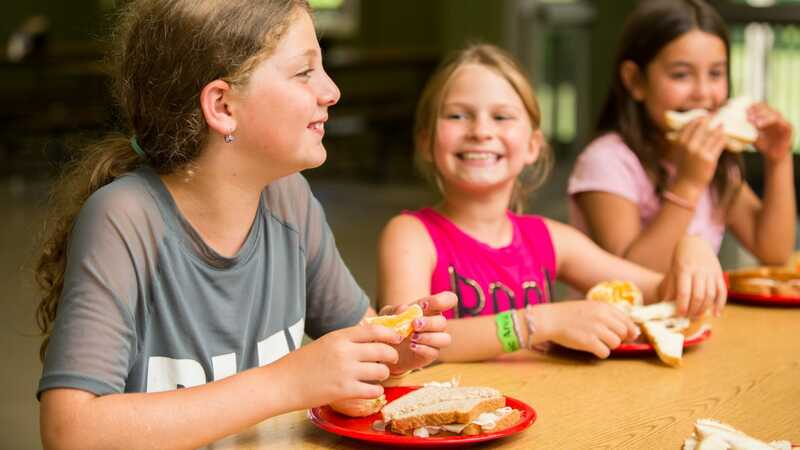 While we encourage our campers to try new things as part of the sleep-away experience, we also prepare options for our pickiest eaters to ensure no one goes hungry!